Danny Ferry has been working very hard the past few days trying to put a deal together to bring All-Star forward Amare Stoudemire to join Shaq and Lebron in Cleveland. According to various reports close to the negotations, the Cleveland Cavaliers and Phoenix Suns are closing in on a deal. 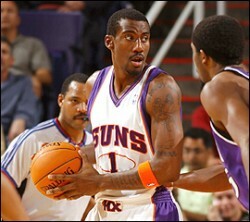 The deal would send Zydrunas Ilgauskas and J.J. Hickson to Phoenix in exchange for Stoudemire. The Cavaliers are also invovled with several other teams including Troy Murphy from Indiana and Antawn Jamison from Washington. However, Stoudemire is first on Cavs general manager Ferry’s list. By bringing another All-Star to play along side Lebron, Danny Ferry and Cavaliers owner Gilbert hope that would make the Cavaliers a championship contender for many years to come and make the job of re-signing Lebron James much easier. The Suns will likely waive Ilgauskas, which would allow him to be re-signed by Cleveland after 30 days. The Cavaliers are also prepared to sign Stoudemire, who has one year and $17 million remaining on his contract, to a long-term contract extension once the season ends. Amare is 27-years old and averaging 21 points and close to 9 rebounds per game this season.